Northampton Borough Council is set to offer no objections to the planned construction of a new waste transfer building at Edgar Mobbs Way. It is expected that there would be approximately 105 waste deliveries and nine bulk loads removed from the site, which is being proposed by Northamptonshire County Council, every day. The county council is putting the proposal out for consultation with local stakeholders, and colleagues at the borough council - which is responsible for planning - look set not to offer any objection in principle unless the Environment Agency raises any concerns over the scheme at a later date. Members of the borough council’s planning committee will discuss the authority’s response next Tuesday (January 22). Another condition of winning their approval, however, will be to improve the appearance of an office building which forms part of the application. It is currently planned as a two-storey prefabricated structure with red facing brick walls. Borough council officers write in a report to the planning committee: “The building is situated in a prominent location towards the front of the application site, which is situated within Northampton Waterside Enterprise Zone. The proposed waste transfer building, which would create five full-time jobs, is intended to serve Veolia’s local contracts and trade waste collection business. The waste delivered to the site will mostly be dry materials such as paper, plastic and glass, with small amounts of metals and similar materials. The facility is being proposed so that there are ‘better recycling facilities than currently exist’ and the building would operate from 7am to 7pm on weekdays, with reduced activity at weekends and Bank Holidays, but ‘with potential’ to extend to a 24-hour operation. 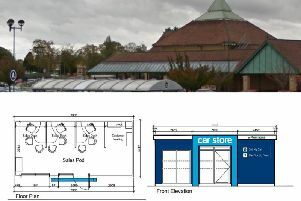 The county council scheme would also include a vehicle fuel station, vehicle wash bay, sprinkler tanks and pumphouse, with 44 car parking spaces and 15 spaces for refuse vehicles. Despite being close to some homes, the borough council’s environmental health officer has ruled it ‘unlikely that the proposal would result in any significant noise and disturbance above that which already exist’.